The “Theater in the Wild” has been transformed into the undersea world of Marlin and Nemo. 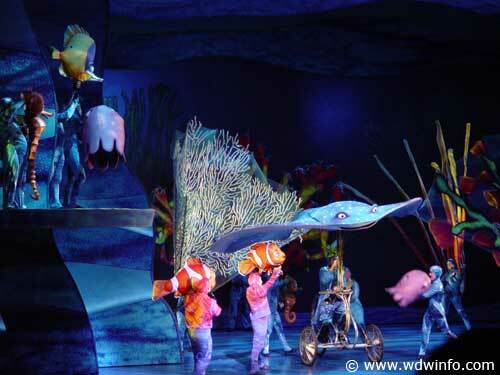 Through the use of puppetry, acrobats, dancers performing against an animated backdrop, “Finding Nemo” comes to life. Before the show even starts, you’ll start hearing children yelling “Nemo!” and you look up to catch a glimpse of Nemo swimming through one of the plastic bubbles on the side of the stage. It’s a great way to get the kids interested in what’s coming. The puppets for “Finding Nemo - The Musical” were designed by Michael Curry, creator of the amazing puppets for Disney’s Broadway smash hit, “The Lion King.” The oversized sea creatures include Crush who is the size of a VW Bug and the incredible 22 foot tall Nigel the Pelican. Finding Nemo - The Musical is wheelchair accessible. Reflective captioning and assistive listening receivers are available upon request. There are currently 34 reviews for Finding Nemo - The Musical. Read Full Finding Nemo - The Musical Reviews! You can also search for Finding Nemo - The Musical specific threads! Finding Nemo - The Musical Tips! The show takes place in an air-conditioned theater, so it’s a great way to get out of the heat for a little while. Plan on getting in line around 1/2 an hour before the show starts, as it is very popular and will fill up quickly. There is plenty of singing and dancing and should easily keep kids entertained during the whole 30 minute show, which is a shortened version of the movie’s story.